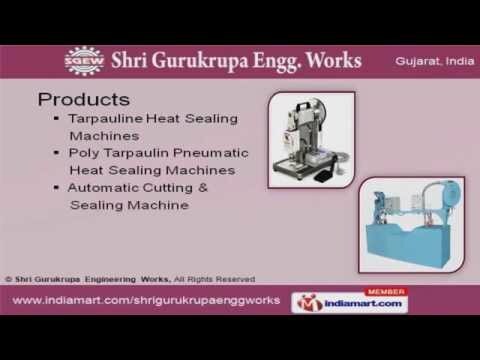 Welcome to Shri Gurukrupa Engineering WorksManufacturer & Exporter of Tarpaulin Heat Sealing Machines The Company was established in the year 2000, at Vadodara. Our state-of-the-artinfrastructure & Specialized R&D department make us stand apart from also-rans. On time delivery schedule, International quality standards & dedicated workforce are thefactors that help us to stay ahead of our competitors. Design, Performance, Tensile Strength & Maintenance are the some QualityParameters. Our workforce comprise of Engineers, Technicians, Quality Controllers & SkilledLabourer. We offer a wide array of Automatic Cutting, Tarpaulin & Poly Tarpaulin Pneumatic HeatSealing Machines. Tarpaulin Heat Sealing Machines offered by us are widely acclaimed in the market. Our Poly Tarpaulin Pneumatic Heat Sealing Machines are available at industry leadingprices. Along with that we offer Automatic Cutting & Sealing Machines that are a class apart. For more information log on at: www. indiamart.